While it would be a fool’s errand to try and count all the instructional books on, say, bluegrass fiddle, blues guitar, or clawhammer banjo, the number of books on oldtime backup guitar fits pretty comfortably on two hands, and that’s if you’re being generous. If you’re not, then I’d say the number was three. 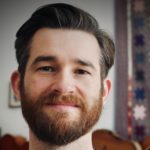 Going chronologically, Joseph Weidlich’s Old-Time County Guitar Backup Basics (2005), John Schwab’s Old-Time Backup Guitar: Learn from the Masters (2012), and The Flatpicker’s Guide to Old-Time Musicby Tim May and Dan Miller (2013). 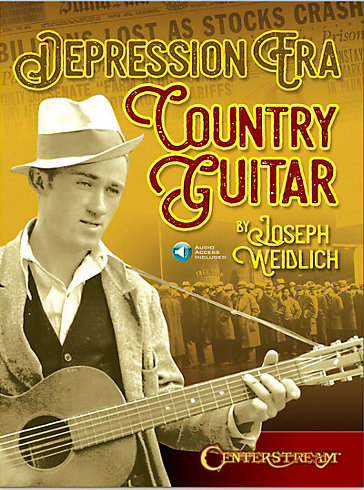 Now Joseph Weidlich has brought out another book to add to the short list: Depression Era Country Guitar (2017). The explicit focus of Weidlich’s new book is on the developments in guitar backup styles in the late 1920s into the Depression era. But the commercial pressures to create novel, saleable records were no different then than today. Guitar players of the 20s and 30s were soaking up the latest sounds of jazz, ragtime, stride, blues, Broadway hits, and more. And their playing was changing as a result. Weidlich’s new book focuses on those new developments in guitar backup, such as, “the use of eighth note strumming patterns, use of left hand embellishments (hammer ons, pull offs, and slides), development of chromatic note sequences”. 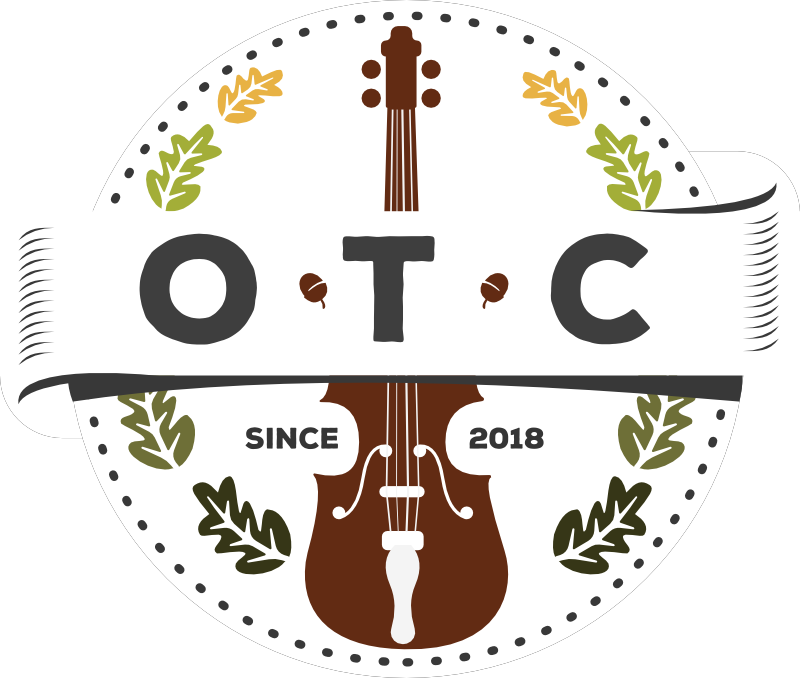 These additions are significant enough that Weidlich has decided to coin the term “Depression Era country guitar” as a seeming transition between oldtime and early bluegrass styles. Above all, Weidlich locates the origin of these new tricks in the guitar playing of Maybelle Carter and Jimmie Rodgers, to which he addresses the first part of his book. While very different players in many ways, both Carter and Rodgers began to add greater variety to their guitar work than had been common in years previous, with the notable exception of the inimitable Riley Puckett. Maybelle Carter, strongly influenced by the African-American musician Leslie Riddle, and Jimmie Rodgers introduced more syncopated rhythms, chromatic bass runs, and notes accenting the melody than before. The result was a guitar backup style that transitioned from being a solid foundation for the melody instruments to one in which the guitar players was participating more actively in the musical conversation, if in subtle ways. Depression Era Country Guitar is structured – over its 80 pages – into twelve sections, each focusing on a particular backup idea: 2- and 4-measure bass patterns, the use of the pentatonic scale, ragtime changes, chromatic sequences, double and triple stops, and more. Each section begins with an explanation of that particular musical idea and then presents a variety of examples of its use. Some examples are as short as two measures while others cover an entire chorus. Overall, there are more short examples, than longer ones. By addressing each one of these backup ideas separately, Weidlich provides a good overview of the basic toolbox available to guitarists in the era. While Schwab’s approach was to teach the style through full transcriptions, Weidlich’s approach is to build out a toolkit of runs, scale uses, rhythmic ideas, etc. that the player can then use to build their own backup style. focus on common oldtime keys. No weird examples with little use here. The book is filled with examples of backup guitar ideas, mostly taken from source recordings in the 20s and 30s. But a great many of them a provided without complete information on which recording they come from. Given that 99% of this material is currently available for free on YouTube or other online sources, this is a shame, as Weidlich himself certainly knew which recordings they were drawn from. Providing that information would have made it much easier to track down the source recordings and listen to them. While the book is systematic in its approach, with chapters dedicated to different musical ideas, it’s certainly not comprehensive. Whereas a complete beginner could start with May and Miller’s book or Schwab’s, this book is better suited to players who already have the basics under their belt. This may seem silly, but I found the images problematic. 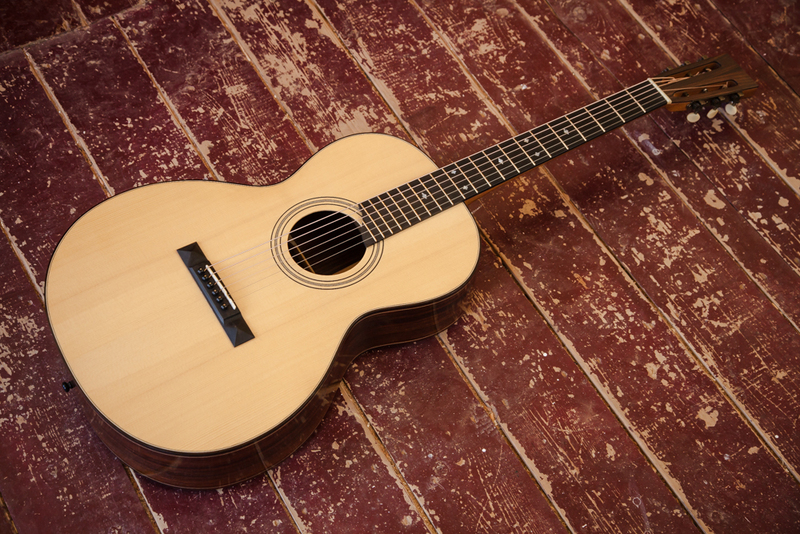 Depression Era Country Guitartries to make the case for a distinct form of backup guitar that developed in the first decade and a half of recorded American popular music. While about half of the pictures used in the book are of performers from the time – publicity photos that make perfect sense in this context – the other half depict highly stereotyped settings from the Great Depression: donation lines, an impoverished family in a tent, unemployed men lining up at a soup kitchen, a dustbowl farmstead, as well as unidentified black and white musicians. The publicity shots name their subjects, but the remainder of the images are unattributed. I worry that the function of the images is to create a kind of poverty nostalgia for a time when “real folk” played “real music”. Depression Era County Guitar is a great book for anyone interested in oldtime backup guitar or those wishing to understand the range of musical options open to them. I must admit, being familiar with all the books currently available, I can’t anymore say where the best place to start would be. Schwab’s book gives such a solid introduction to the practice itself with great, straightforward transcriptions, that it’s hard to go wrong. At the same time, if you’re looking for more musical variety in guitar backup, then May and Miller’s book provides the greatest range of examples, almost going to extremes to spell out every possibility in terms of musical tools, covering most all the same topics as in Weidlich’s latest book. My qualm with May and Miller’s book is the transcriptions that make up the last half of the text. To my ears, they fit neither the historical models, nor the styles of contemporary players well. Depression Era Country Guitar occupies a kind of middle ground, focusing on a variety of ideas and techniques that can be freely used in oldtime backup guitar, while largely using historical examples that “sound right” to my ears. In the end, I think anyone serious about oldtime backup guitar who also enjoys learning from instructional books would do well to soak up the material presented in all these books. In the sparse landscape of materials for aspiring oldtime guitarists, Depression Era Country Guitar is a welcome addition.